Yesterday my daughter decided to wear her red, jeweled Snow White crown not just for dress up but ALL day long. She even wore it to the hospital when we visited her brand new baby cousin. She's hoping that her cousin (her very first girl cousin) will enjoy princesses and want to play with dolls, so she's is taking on the task of introducing her cousin to all things princesses. Princess lessons have commenced. Below is a book that should be included in each and every princess book collection. "They have been hidden so well, some no longer even know themselves. But now all will be revealed -- the behind-the-scenes stories and secret lives of the world's unknown, anonymous, and vanished princesses." A definitive guide for unusual princesses, The Secret Lives of Princesses highlights a few familiar and several not-so-familiar royal characters. Originally published in France with the title of Princesses oubliées ou inconnues, this princess album is one to pour and ponder over. The extravagantly illustrated pages contain well over 25 princesses (and even a few princes) plus detailed information of all things princess including palaces, gardens, meals, coats of arms and confidantes. This Who's Who of princesses book includes Princess Babbling Brooke, Princess Quartermoon and Princess Ices. There are also some downright scary princesses like Princess Hot-Head, Princess Sticky-Fingers, The Faceless Princess and Princess Primandproper. And there's even a bearded Prince S.
A mesmerizing compilation, girls, especially ones that may be a little too old for the cartoon Disney princesses, will find a lot to like in The Secret Lives of Princesses . The illustrations by Rébecca Dautremer are beautifully done, with loads of detail. One such example: The page spread showing one of my favorites, the bookish Princess Paige, includes hundreds of tiny cut out letters tumbling down her lap. My daughter loved browsing through the book with me and decided upon a few favorites, too, picking out all the tiny princesses - the dragonfly like Princess For-A-Day, thumbed-sized Princess Thimbelina and the minute Princess Claire Voyant. She also picked out her favorite castle (the basic model with options) and we practiced our fan gestures using The International Alphabet of Fans. I would especially recommend this book to fans of all those 'Ology books (Dragonology, Wizardology, etc. ), even though it lacks interactive pull-outs. How does my daughter stand up to the tips and techniques in the back of the book to tell a true princess? Yes, she pretty much passes the test. Not overly surprising though, considering her mother is of royal blood. From now on, please address me as Her Highfalutin’ Vivacity, Princess Janelle, Adroit Spelunker of Brimful Curiosities. 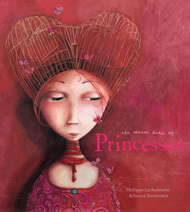 Discover more about the princesses and learn your own princess name at http://secretlivesofprincesses.com/. If my daughter had a choice, she said she would be like to be Princess Flower Petal (a princess of her own creation not included in the book) and oversee large flower gardens. For the craft this week, she drew a purple Flower Petal Princess and, inspired by this book dress girl by Juliette Crane, she covered the princess dress with glued-on velvety violas. 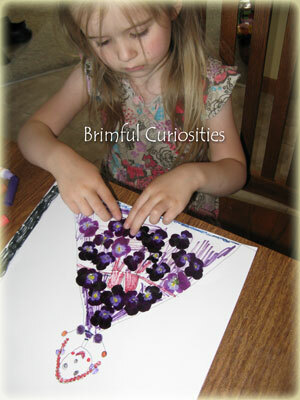 After she finished her mixed-media art, we covered it with contact paper to help preserve the violas. Ooh, lucky you to have this book - I've seen it in several places and think it sounds wonderful. And your daughter's craft is beautiful :-) I'd love a dress made of violas too - just think how wonderful it would smell! And you may address me as Her Magnificent Stateliness, Princess Christianne, Groggy Sweetheart. That pretty much sums it up - at least the groggy part. Love the flower dress! She made such a beautiful picture! Wow what a great idea.. Great colors. My round robin is tomorrow if you want to link this up. I love it! My girls would ADORE this book, I'm sure. 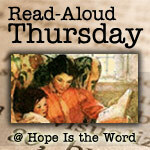 I'm adding it to my TBR list! Oh My, what a lovely sounding book! I have a little boy and a baby girl.. maybe one day... Going on my wishlist so I dont forget about it!! Love your princess with the flowers! Lovely! 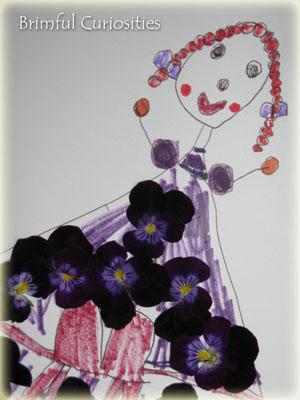 Your daughter has wonderful imagination - her flower petal princess is lovely. I saw this book, but I think we have to wait a couple of years until daughter is older. I love the idea of that dress. I wonder what princess name my daughter would choose. Probably Princess Batman. Ooo, that's beautiful. She did a great job. We're still doing our Princess Unit; I'm going to look for this book. Gorgeous! I'm so impressed and am going to copy this activity right away with my girls. THANKS! This sounds like a fun book -- and I love the pansy dress too! What gorgeous little princess! My little guy has taken to wearing his superman cape all.the.time. Makes for some interesting conversation standing in check out lines.